Use the ad builder to build Google remarketing ads to bring people back to your website. We'll use the Google Ad Display Network to show your products to people who visited your site or landing page. This can help you get more web traffic and conversions. In this article, you'll learn how to create your own Google remarketing ad through Mailchimp. Google remarketing ads are available to users who publish a landing page, or connect a supported e-commerce store or website. To find out if your store supports this feature, visit the Connected Sites page. If you’ve already connected your e-commerce integration, make sure it's up to date. If you’re using a landing page in a Google remarketing ad, make sure to accept our additional terms on your landing page’s Settings and Tracking section. You’ll only need to accept the terms one time. 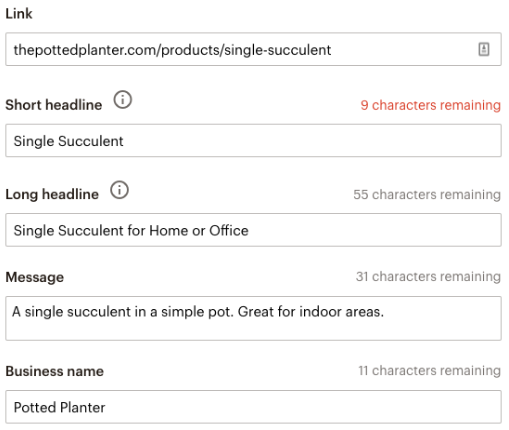 Be sure to disable ad blockers in your web browser to make sure Mailchimp's ad builder runs smoothly. Google remarketing ads have a unique billing system. You'll set your weekly budget and purchase your ad, which will continue to run until you decide to cancel it. Google’s responsive ads can show up in different formats. Depending on placement, your ad might display without an image. If your ad doesn't fit Google ad requirements, Google can reject your ad. To get started with your Google remarketing ads, you'll choose which store or landing page you want to promote, and set your ad budget. To define your audience and budget, follow these steps. Type a campaign name and use the drop-down menu to choose the connected store or published landing page you want to promote. Click Begin to enter the ad builder. In the pop-up modal, click to accept the terms and conditions. In the Budget step, click Edit Budget to review your weekly budget. The default budget is $21 per week, but you can go as low as $7 per week. 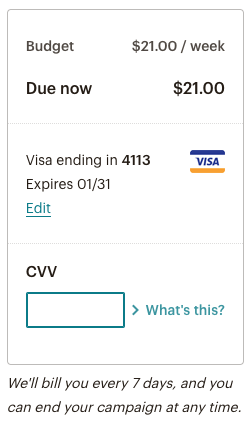 Use the Amount field to set your weekly budget. You'll be billed this amount once per week until you end the ad. Next, you'll navigate to the Content step to start designing your ad. Your Google remarketing campaign can advertise up to 5 products of your choice. Each ad will display one product at a time. If you’re retargeting visitors to a connected store, you can also choose to advertise your top 5 sellers. In this tutorial, we'll show you how to create a campaign with 5 custom-picked products. To add your content, follow these steps. Ads for landing page visitors will only show the Create Your Own button. In the Image placeholder, click Browse Images to choose an image for your ad. If you also want to include a logo, click Browse Images in the optional Logo placeholder. In the fields provided, include your first ad's link, short headline, long headline, message, and business name. The headline is the first line of your ad. The short headline will appear in small ad spaces, and the long headline will appear in larger ads. Be sure to avoid commonly rejected text like all caps, too many exclamation points, and curse words. Click the next ad in the group, and repeat steps 2-4 until all ads you want to include are customized. 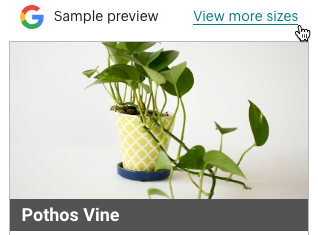 After you choose text and images for your ad, check out your ad preview. Preview mode shows examples of what your ad could look like in few common placements. 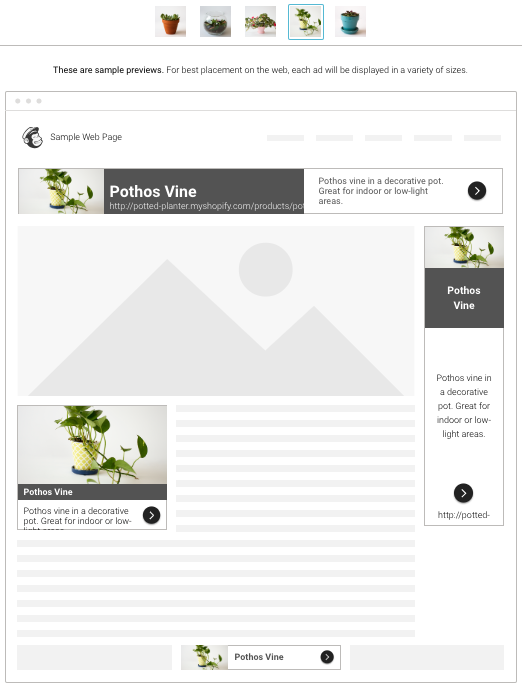 After it's published, your ad will show in a lot more places and layouts. To preview your ads, follow these steps. Click View more sizes to enter preview mode. Click each of your products to see your previews. These previews show what your ads might look like on the web when they're published, but they typically won't appear multiple times on a single page. 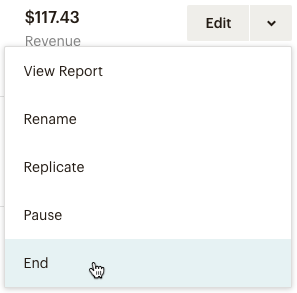 Click X to return to your ad, and use the Ad Builder to make additional changes. When you're done, return to the preview mode for a final review. After your content is designed and and reviewed, it's time to submit! Now that your ad is set to go, read about what happens after submission, and what you can expect to see in your report and your weekly bill. To permanently stop an ad from running, you can cancel it. After your ad is canceled, please allow us 72 hours to send you an ad credit for any remaining unspent budget. In the pop-up modal, type END CAMPAIGN to confirm, and click End Campaign. Learn about Google's ad review and audience building process, and what to expect after you publish a retargeting ad.